Are you on the hunt for a new smart lock but are utterly confused by the variety of products and wide range of features? Or, have you narrowed your choice down to a few different locks but you don’t know whether to buy the August lock or the Schlage Connect? Welcome along to my review of four top smart locks. 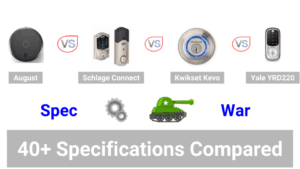 In this review, I compare the August vs Schlage Connect vs Kwikset Kevo vs Yale YRD 240. Over forty specifications are looked at and presented in easy to read and lovely looking charts. This chart displays most of the important features of smart locks and whether any of the smart locks in my comparison have them. It is for any of you who are in a rush and unable to read the full written review below! If you would like to read a written description of the comparison table, please click on the “Read More” link below the chart. All of the locks in this comparison have an auto lock feature. All of the smart locks have apps for iOS (Apple) and Android devices. Three of the locks have an ANSi (American National Standards Institute) rating for security. An ANSI rating is highly regarded as a sign of security. The only lock that doesn’t have an ANSI rating is the August lock. The chart shows that there are three different ways that these locks can be opened. It is important to note that even though some of these locks can be opened with a mechanical key, these should really only be used in an emergency. The August lock can be opened by using a smartphone and a key. It can also be opened by using a number pad but this needs to be bought separately. The BE469 can be opened using a smartphone and a number pad. The Kevo can be opened by a smartphone, key and a fob. However, the fob does need to be purchased separately. The YRD220 uses a number pad, smartphone or key to open. All of these locks can be controlled by voice but they all need to be connected to two other pieces of equipment in order to make this happens. The August lock will work with Alexa, HomeKit and Home. The BE460 only works with Alexa. In this section I compare some of the basic features of these smart locks. If you would like to read a written description of the comparison table please click on the “Read More” link below the chart. So looking at all the manufacturers each of these smart locks is made by a different company. Yale was founded in 1868, Schlage in 1920, Kwikset 1946 and August in 2012. That makes Yale 142 years older than August. Ironically, the Yale lock in this comparison is also the oldest, launched as it was in August 2011. The Kevo is the newest lock and was first on sale in September 2016. There is a huge difference in the weight of these locks. The August smart lock is only 14 oz whereas all the other locks are over 61 ounces. The reason for this is that the August lock does not contain a separate deadbolt and all the other locks do. The Yale and the Schlage locks are also much bigger because those locks contain a number pad and the Kevo and August don’t. It is important to mention that prices change all the time so make sure that you are aware of the exact price of any of these doorbells before you buy them. when I was creating this video, the August and the Kevo were the most expensive locks at $229 whereas the Schlage and the Yale are about $179. In this section I compare how each of the for smart locks can be opened. Going from left to right at the top are the main methods that smart locks can be opened and they are; keypad, smartphone, traditional or mechanical key, fob or tag or fingerprints. The Schlage and the Yale locks have a built in numberpad. On both of these locks, the numberpad is a backlit touchscreen. And you can buy a numberpad for the August lock separately. The Kevo is the only smart lock that doesn’t use one. Two of these locks can be opened directly by using a smartphone as a key. The August and the Kevo will open the lock if you hold the phone up to it. The Schlage and the Yale lock cannot be used like this. All of these locks can use a smartphone to unlock them remotely, but this is a slightly different way to use a smartphone and it will be discussed in much more detail later. All four of these locks can be opened using a mechanical or traditional key. If you install the August smart lock then because you use the same deadbolt you can sing you to use your existing key. The Schlage, Kevo and Yale locks all come with a mechanical key for you to use. Some automatic locks use fobs or tags to open them. The only lock in this comparison but can be opened using a fob or a tag is the Kevo. But the fob will need to be purchased separately! There is a growing number of smart locks that use fingerprints as a means of opening the lock is growing. However, none of the smart locks in this comparison can be opened using this method. Two of these locks can connect to wi-fi via a wi-fi bridge which is a mini router that connects the lock to your home wi-fi network. Bridges are one method of remotely unlocking smart locks. These bridges need to be purchased separately and they cost about $50 each. . The August and the Kevo use Bluetooth to connect two smartphones as a means of opening the lock. The Slade and the Yale don’t use Bluetooth in any way. All 4 of these locks can connect to a smart hub or network controller as part of home automation systems such as Amazon Echo and Wink. The August lock is the only lock in this comparison that doesn’t have an official security rating from ANSI which is the American National Standards Institute. The Schlage and the Kevo locks both have a grade 1 residential rating and the Yale has a grade 2 residential rating. Privacy features are normally only found on locks that have number pads. They stop any “prying eyes” from recognising a code or Personal Identification Number (PIN). The Schlage and the Yale lock both have fingerprint resistant screens. This means that fingerprints will not be left on any of the numbers that have been used as part of a PIN. The Schlage and the Yale are the only two locks to have built-in alarms. And, each lock has two different alarms. One alarm will sound if anyone is tampering with the lock and the other alarm will sound if anyone is trying to force entry. The Kevo and the August don’t have any alarms which I think is a weakness and make the locks a lot more insecure. The final feature in this section that I will discuss is, emergency opening methods. Because all of these locks are powered by batteries, they all and alternative means of opening them in the rare situations where the power fails. And all of these locks use a mechanical key in an emergency! In this section, for the four locks in this comparison, I will look at features that relate to PIN codes. The first feature that I want to focus on in this section is the auto lock feature. Auto lock is the ability of a lock to automatically lock after an interval of a few seconds after it has closed. This is an essential feature in any smart lock because it is just one less thing that you have to remember. All four of these locks have the auto lock feature. It will help you when you are in a rush and you have lots of things on your mind as you come in through the front door. Or, if you come through the front door with your hands full of shopping. It means you can just make sure the door is closed and it will be automatically lock for you. It is one less thing to worry about. Remote unlocking is the ability to open your smart lock even when you’re not at home. The August lock and the Kevo can be remotely unlocked in two ways. Firstly, is by a wi-fi bridge which was discussed in some detail above. The second way that these two locks can be remotely unlocked is when they are part of a home automation system. More on that will be discussed later. The Schlage and the Yale lock can only be remotely unlocked by being part of a compatible home automation system. Personal Identification Number (PIN) length and storage capacities only apply to locks with number pads, which means that this feature only applies to the Schlage and the Yale lock. The Schlage and Yale lock will accept any code or pin that is between 4 to 8 digits long. The Schlage can store up to 30 different codes whereas the Yale lock can store up to 250 different codes. Smart locks must not only keep the wrong people out but they must let the right people in. This must be done in a very manageable way, particularly for occasional visitors. An example of this is when locks are used on rental properties. The August and the Kevo both allow an owner to create virtual or e keys. [*] Any time these keys are used, you will be notified via the activity log on your phone. The Yale and Schlage locks do not use virtual or e keys but allow you to create pins for guests or occasional visitors. The Yale lock in particular, with its 250 code storage, has plenty of potential. Both the Yale and Schlage locks can create pins instantly, with flexible limits on their use. This all needs to be done via the home automation app that the lock is integrating with. All four of these locks provide an “activity log” which shows you when your lock is being used, by whom. For the August and the Kevo this is via their very own apps. For the Schlage and the Yale this log is part of the specific home automation app that you are using. In this section, I will compare the most important features of a smart lock that relate to design, power and warranty. Each of these locks is available in more than one choice of colour-and that is not something that I say too often in smart device comparisons! The August lock comes in four colours; Silver, dark grey comma champagne and red. The Schlage Connect comes in aged bronze, bright bronze, Bright chrome satin chrome, Matte black and satin nickel. The Kwiket Kevo comes in three colours Polish brass, Satin nickel and Venetian bronze. And the Yale YRD220 lock also comes in three colours- Oil rubbed bronze Polished brass and satin nickel. Moving onto installation, all of these locks can be installed just using a screwdriver. All of these locks are powered by 4 AA batteries. Three of these locks are weatherproof. The August lock is not weatherproof because it is fitted on the inside of any door. All Of the other smart locks are for use outside. What is interesting is that none of them have an IP rating . IP stands for Ingress Protection and it is an industry wide rating that shows how protected, a product designed to be used outside, is against the elements. The Kevo, Yale and Schlage all have a temperature range that they can only operate with in. Unfortunately I could not find any details on the specifics for the Kevo. The Schlage operates in temperatures between -35 to 60 °C and the Yale has a similar temperature range of between -30 to 60 °C . Only the Yale lock has voice operated set up. This is a spoken guide that takes you step by step through setup. I think this Guide comes in one of three languages English Spanish and French for the Yale lock. Voice guided setup is not to be confused with the voice commands that these locks can be controlled by when linked to the Amazon Echo system. Only one of these locks the August lock uses your existing deadbolt. The other three locks come with new deadbolt that you must use. The August lock also is the only lock to have a 1 year limited warranty. The Schlage, Yale and Kevo locks all have a lifetime warranty for mechanics and finish. In section 6, I will compare the compatibility of these four smart locks to the most popular home automation or smart home systems. Home automation is the ability of a device to interact with other devices in the home. There are numerous systems and languages that different smart devices use. The first system is IFTTT. IFTTT is a website and an app that connects many different smart devices using applets. Applets can can be created by the manufacturers of the products or by enthusiastic users. All applet can be used by anyone for free. August and Kevo are official services on IFTTT and by this I mean that the company have created applets themselves. Yale and Schlage have applets that can be used but these applets have not been made by either Yale or Schlage. All four of these smart locks work with Amazon Alexa. Alexa is Amazon’s voice operated digital Assistant that is evolving into a very large home automation system. In order for any of these locks to work with Alexa you need to already have or be willing to buy an Amazon Echo or Amazon Dot. These are interactive speakers which are evolving into smart home hubs. Only the August lock works with Homekit which is Apple’s own smart home system. August have created a specific model that works solely with Homekit. The August and the Kevo locks work with the Nest system and the Wink system but in order to do so, you need to buy and use the wi-fi bridges that we discussed earlier. Also if you want the locks to work with Wink, you will also need a Wink smart hub or be willing to buy one. Whereas the Schlage and the Yale lock are not compatible with Nest they are with Wink and SmartThings. They don’t need any wi-fi bridges but you will need a Wink or SmartThings smart hub. The August lock is the only one of these locks in the comparison that doesn’t work with the SmartThings system directly although it will interact with it using some IFTTT applets. In section 7, I compare how each smart lock can be remotely accessed. Remote access is the ability to control a smart device without physically touching it and so you could be 2 metres away from the device or 2000 km away from the device and still control it. Remote AIf you would like to read a written description of the comparison table, please click on the “Read More” link below the chart. In section 2 of this comparison, I briefly explained that the August and Kevo look can be opened using a smartphone and the app. These apps only allow a user to open a lock when are standing next to it with their smartphone. The apps do not provide remote access. Although I think that the August app may provide that lock with remote access capabilities. Anyone out there who knows differently, please let me know. Remote access for iOS or Android devices is provided via specific apps for different home automation systems such as Wink or SmartThings. Remote Access can also be granted via web browsers. The Schlage, Kevo and Yale can be remotely accessed via a web browser as long as they are connected to the Samsung SmartThings system. The Wink system does not allow remote access via a web browser. I don’t think that the August lock can be remotely accessed via a web browser either. In section 8, I compare the reviews and ratings that each lock has received on Amazon. What I have tried to do is to show some of the most helpful statistics to help us work out which are the most popular and the most reliable locks. To state the obvious, these numbers will change very regularly but I think that the overall trends that these numbers reveal will not change that much. The Schlage Connect has an overall rating of 4.3 out of 5 and the Yale has a rating of 4 out of 5. The August only gets 3.6 out of 5 whereas the Kevo has a very disappointing 2.7. The Schlage has the highest number of written reviews with 2015 and next is the August lock. The Schlage and the August are 1 and 2 for the number of written questions. Three of these locks have a low percentage of 5 star reviews- August, Schlage and Yale all have ratings in the sixties. Many successful products have 5 star ratings in the 70s. Also, their percentages for 1 star ratings are high. They are in double figures and ideally you want to see these percentages at 5 or less. The Kevos percentages are very poor. It has a higher percentage of 1 star reviews than 5 star reviews which is highly unusual. Finally in the last column is a Fakespot grade. Fakespot analyses a product’s reviews on sites like Amazon and then gives them a reliability grading- the higher the grade, the more trustworthy that the reviews are. The Yale lock has an A grade and the Schlage has a B. The August and Kevo have a disappointing F! Thanks for watching this review of the smart locks- the August vs Schlage Connect vs Kwikset Kevo vs the Yale YRD220. I hope that my comparison of these four locks will help you in your search for your next doorbell. If you have any questions, please ask me. If I have made a mistake, please tell me. Or if you have any ideas for my next review, let me know! In this last section, I have created another chart based around the main features of our four electronic locks. This time though, next to each feature is a “+” (pro) or a “-” (con). This quickly shows us that the two clear winners in this comparison are the Schlage BE469 and the Yale YRD220. Ardwolf A20 Review- The Underdog of the Smart Lock World? Best Smart Door Knob (July 2017)- How Secure Is Your Home?